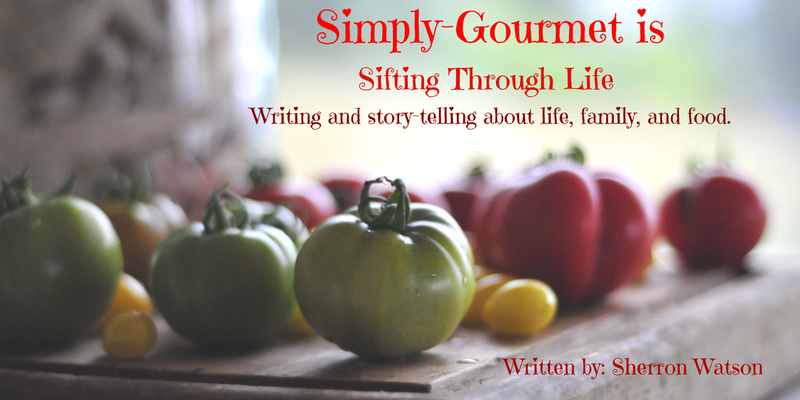 Simply Gourmet: Sifting Through Life: Crabs and Cambridge, MD. Sifting Through Life: Crabs and Cambridge, MD. "I wish I had your job" is a phrase I hear often. In fact, this morning I heard it again after visiting with friends at the elementary school. What is there not to love about food and travel? Our time in Maryland has been short but we have managed to take in many of the sites, small towns, eateries, festivals and scenery. Maryland never ceases to surprise me with its beauty, friendship and the tenacity of those that live and work in this amazing state. 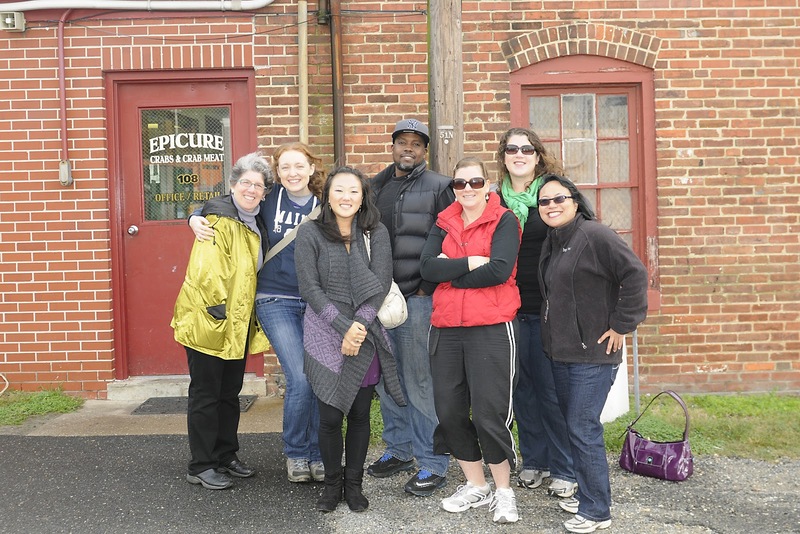 About a month ago I responded to a fellow blogger by the name of Casey, who was trying to garner interest from a group of bloggers to attend a day together in Cambridge, MD touring some local seafood establishments. Casey is a very busy lady. 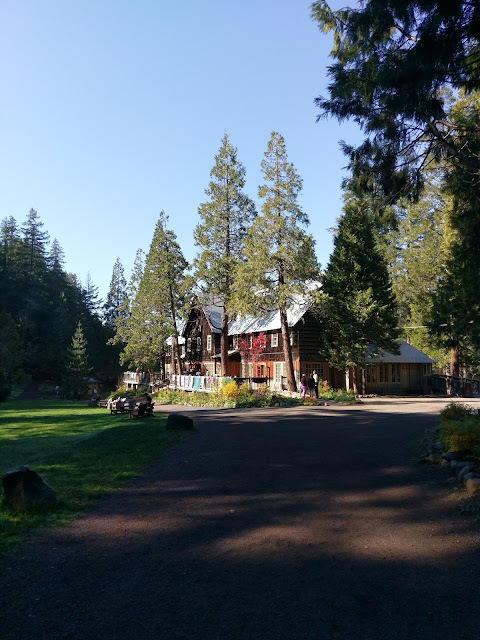 You can visit her site Kitchen Play, her retreat site Eat Write Retreat or her photography site TasteStopping. 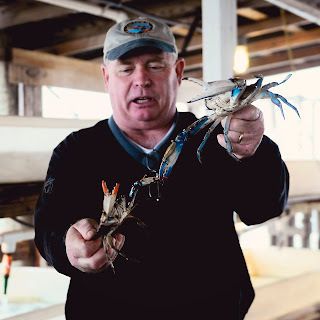 Casey was planning a "field trip" to visit Choptank Oyster Company oyster farm and Jm Clayton Co who owns a crabbing processing business in the town of Cambridge on the Eastern Shore of Maryland. The reason I agreed to Casey's inquiry was very simple. I desired to meet friends in person. I wanted a chance to be face to face with a like minded group of adults that shared my passion, interest and love for all things food. I wanted to connect, reach out and get involved on a local level with those same people on a regular basis. My time writing, cooking and taking pictures at home fulfills a huge part of my identity and who I am, but it lacks in a few areas. Laughter comes to mind immediately. Now don't get me wrong, I laugh at myself all day long and my family gets concerned when I laugh at my own jokes to excess. What I am talking about is the laughter that is shared in a group. Laughter that is shared among friends. The energy that is created when you are in a group and the day is going by way too fast because of the fun that you are having. The second thing I think of is a need for me to revitalize the think tank. I have piles of recipes, magazines, note papers and journals that I have written in and collected. All for the sake of "researching" a recipe, developing a variation or recreating a recipe into a gluten free master piece. My days are spent in a constant state of creating and evolving recipes and ideas in the hopes to satisfy someones midnight snack urge, family dinner, after school snack or Sunday Supper. At times I get burned out. I get overwhelmed. I have brain fog. This adventure out with a group of friends was exactly what I needed and wanted. It is unusual for me to venture out on my own. I will admit I am a pack animal. I was so happy when a few weeks back I met Daphne who would also be attending the tour. I felt immediately at peace. I tend to have a bit of anxiety when trying something new. In the end, I had nothing to fear. The group of attendees that I met were fantastic. They each had their own nitch in the gastronomy field: bloggers, writers, business owners, photographers, adventurist, recipe developers, consultants and social media experts. Many of us wearing different hats at the same time. We all met early Tuesday morning not really knowing what to expect or what we would learn. We had two cars, one traveling from DC and one traveling from Annapolis. We both arrived a bit early. Traffic was good despite the gentle falling of a few rain drops here and there. I don't know how it happens but when you combine a little bit of rain and a cloudy day, the landscape comes alive. Green becomes this vibrant and crisp color that radiates from the fields and tree tops. Red barns pop with color against dull grey skies. Our drive to Cambridge was filled with ooh's and ahh's as we traveled through beautiful farm country, plantation style homes and small country towns. I love the pace, hustle and bustle of the city but the drive to the country was soothing. As we waited for our guide and teacher, Steve from the MD DNR to show up, we were greeted by Jack. A man in his middle ages, with rosy checks, shorts and a happy smile on his face. As he started to tell us about his great grandfathers company we could see the pride and respect that he had for Captain John Morgan Clayton. 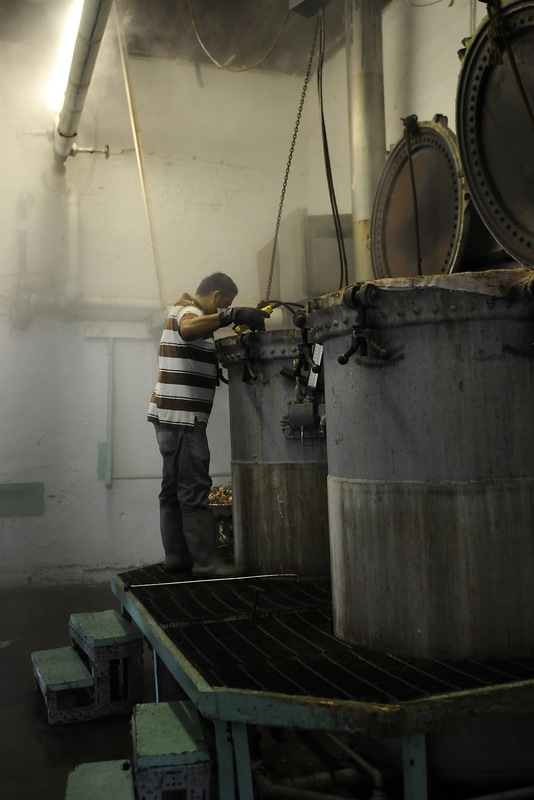 Four generations later this crab processing plant was still in his family. Jack and his two brothers, along with a nephew have kept business coming in the front door. To learn more about the JM Clayton Company please visit there site HERE. This link will take you to their history page so that you can learn more about this native Maryland family and their company. It wasn't long and we were under the covered port area watching Jack and Steve handle the crabs. You do have to be somewhat careful with crabs as they have pinchers . It hurts to be pinched. We were shown crabs of all sizes, males and females, crabs with white underbellies and those with "rusty" bellies. We learned how to tell if a crab is full of meat by gently pushing in certain areas, a simple trick. If it fills hard and full this should yield lots of meat. 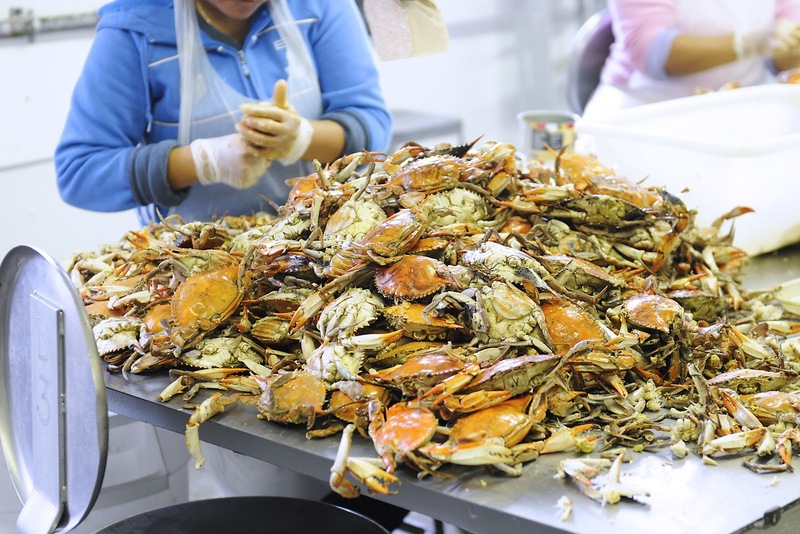 Soft and hollow, you guessed it, smaller amounts of blue crab meat would be available to the eager picker. If you have never picked your own crab, I dare say you are missing out on a unique experience. When you have to work for every little piece of white meat that nestles between your thumb and pointer finger you suddenly become innately aware of time. It takes time to pick crabs. It is a skill that takes patience and practice. My own experience picking my first Maryland Blue Crab was in a local restaurant two years ago when we first moved into Cape St. Claire. The whole restaurant heard me say I had never "picked" before. I had Marylanders around my table as I was given my first lesson. At first I was slow. With time I have improved. 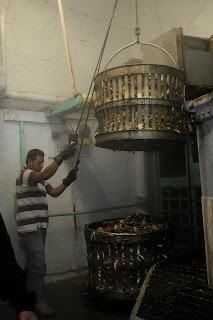 The huge baskets hold 10 bushels of crabs a piece. 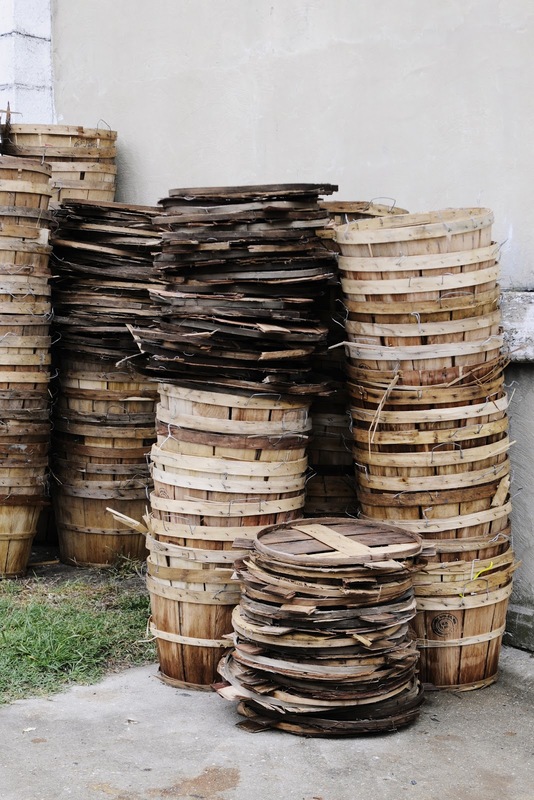 A bushel is about 40 pounds of crab and with a wooden basket, the bushel weight would be around 45 pounds. 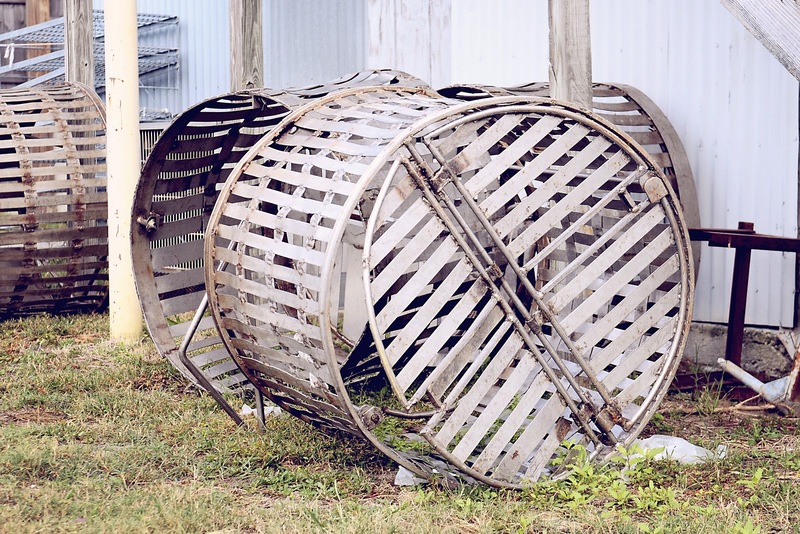 The steamers each hold two of the 4ft X 6 ft steel baskets. I learned that a fresh crab that is uncooked is good for about 4 days. A crab that has been steamed is considered okay to eat up to 14 days. 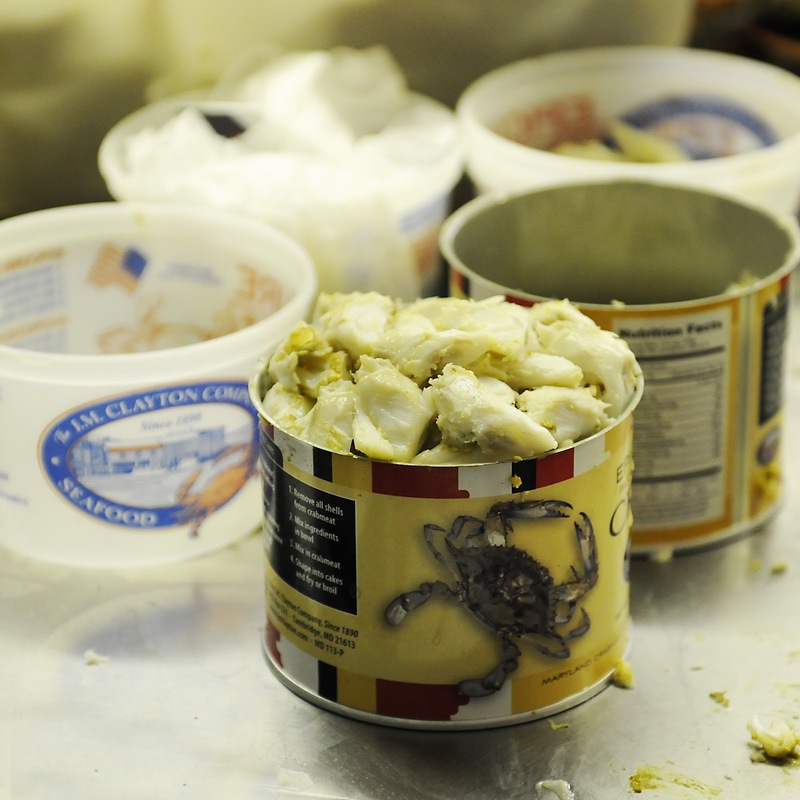 Crab meat that is processed in a can will last up to 18 months or longer. As with all seafood that has been packaged you should follow a few check points. First, smell it. If it smells good, chances are that the fish is okay to eat. Second, look at the fish. If it looks okay then you should be good to go. Finally, taste it. If it still taste fresh, dig right in. If any of these three elements are not good, do not eat the fish and dispose of it immediately. 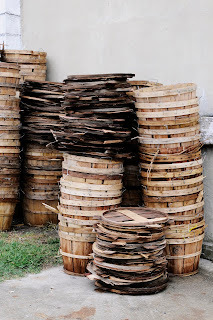 Out of the steamer and into a huge wheel barrow, the crabs are carted across a small drive way to a room bustling with activitiy: the picking room. I can honestly say I was not prepared to see what I did when we walked through the doors. Row after row of fresh crab, cans, meat, trays, utensils and ladies. Lots of ladies HAND picking the crabs. It was all very organized. Jack was very forthcoming with information about the workers in this room. We had many questions and he answered each one for us. He told us that every 1 1/2 hours the ladies get up and have a break. He shared with us how they are compensated for picking the crabs. Each of these ladies, each day, will pick 25-30 pounds of crab. During the busiest time of the season they will average 40-45 pounds per person. 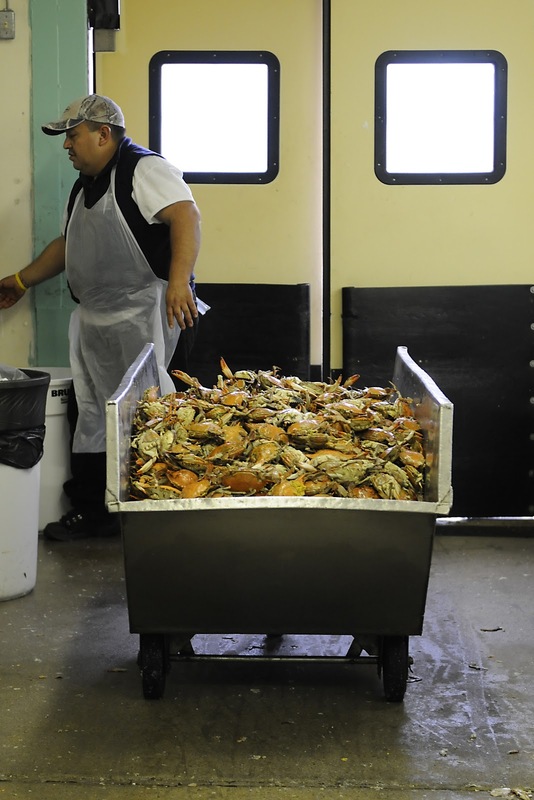 The room will pick 400-500 bushels of crab a day. We were fortunate enough to be on the tour during Jack's busiest month: October. The crabs are at their best. They are full of meat. The crabs are shoveled onto the tables creating piles for the ladies to access easily. The level of focus when we walked in was impressive. They each worked their tools with the expertise necessary to pick crabs in one of the oldest processing plants in the world. Each can is packed a certain way. 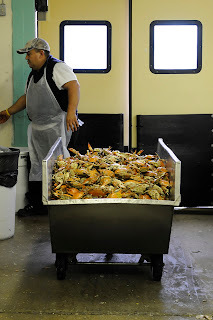 The claws are sent to a separate table to be picked and sold as "claw" meat. See the two pictures below. Why is the crab yellow you may be asking yourselves? Simple: mustard. 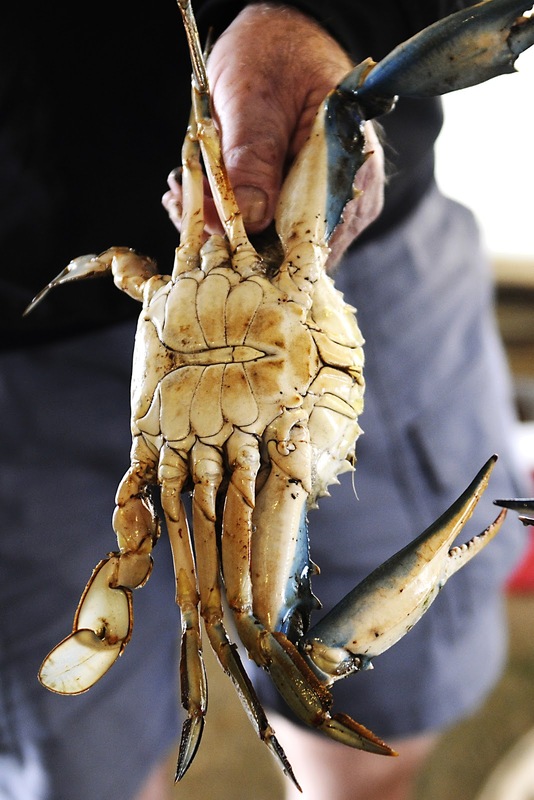 Not the mustard that comes in a plastic yellow bottle that we add to our hotdogs each BBQ season but the sweet yellow substance that you find inside a Maryland Blue Crab. This is what makes it different and unique. The mustard adds color and flavor to the meat. 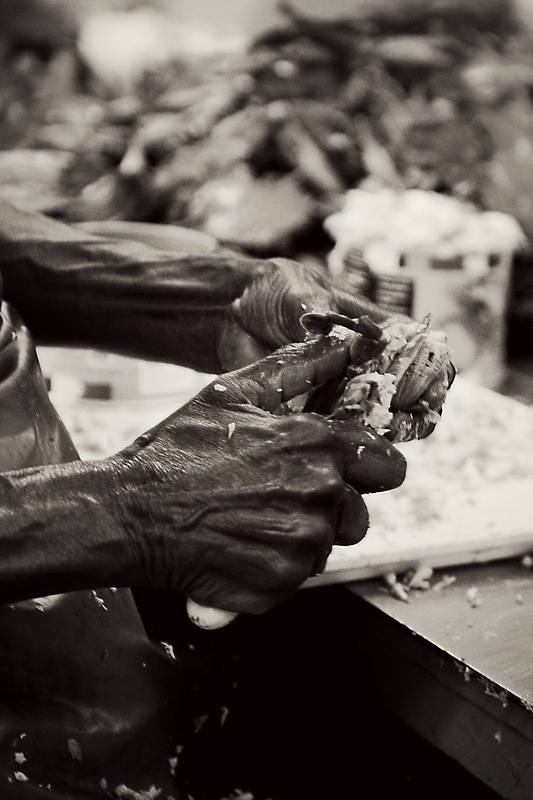 I learned that it is safe to eat and has become a new ingredient for many chefs to play with. I feared eating the yellow because of what I had been taught about lobster mustard. It is different and lobster mustard should never be eaten. It was explained to me that a lobster lives 30+ years and the mustard has time to become toxic, whereas a crab has a much shorter life span and the mustard has not developed those toxins to the degree of a lobster. I am not advocating eating mustard or muster. I have eaten it in the past and find that it is a personal choice and you must do your homework so you know exactly what you are eating. I have shared a link below that will give you a brief explanation of the types. To learn about the tomalley (yellow or green muster) please follow this link HERE. As the cans are filled and the ladies are ready to go to the weigh station a separate room starts to become a buzz. Here they bring the cans and they are each checked and weighed. A large chart on the wall is filled out and the cans are set in rows on a cart with wheels. The cart is taken to the sealer and each can is properly sealed. Every can is given a number on the bottom to identify the person who packed it. If the can receives any kind of feed back they can follow the numbers back to the exact picker. The machine that is currently being used, is roughly 90 years old. An old beast of a machine that still performs the same job it was originally designed to do. As we wound down the first leg of our tour we were all impressed with Jack and his company. 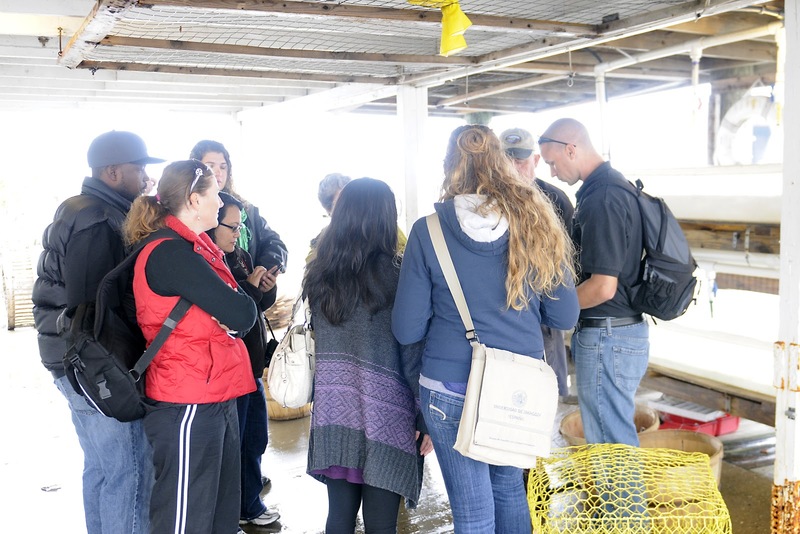 Each of us were thrilled to have learned the process of picking and packaging crab meat. The wheels were turning and I was already planning my next entree using crab meat from Epicure. 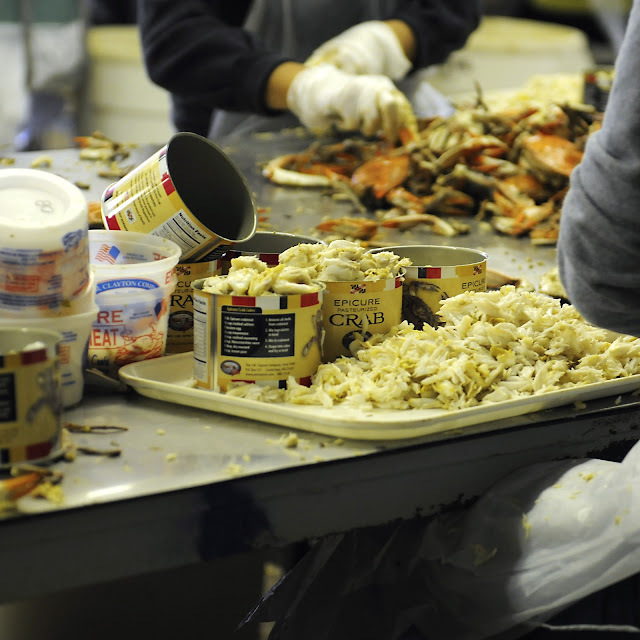 The crab meat from the JM Clayton Company can be found under the name of Epicure Crabmeat. I buy it locally at Whole Foods in Annapolis, MD. They ship this product all over the country. They ship whole crabs as well, next day shipping of course. 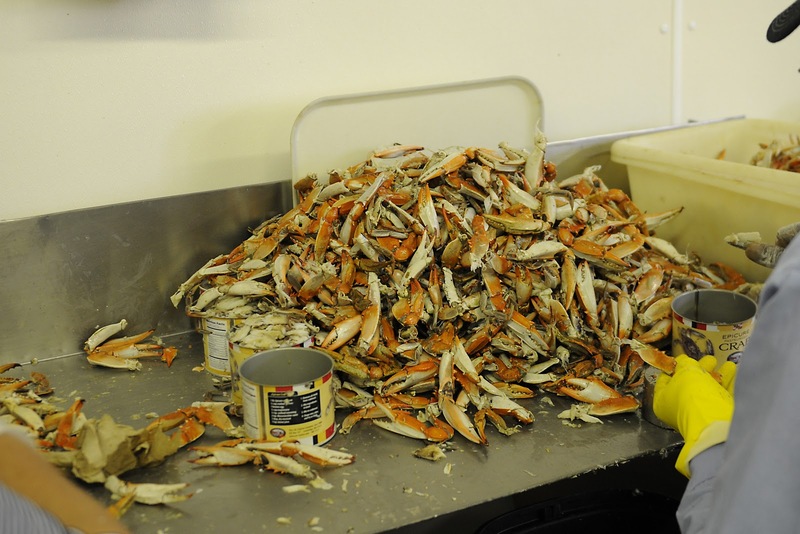 I am grateful that I took Casey's offer of attending the crab processing tour. I learned so much about a a tradition that is deeply rooted in Maryland and along the Chesapeake Bay shores. 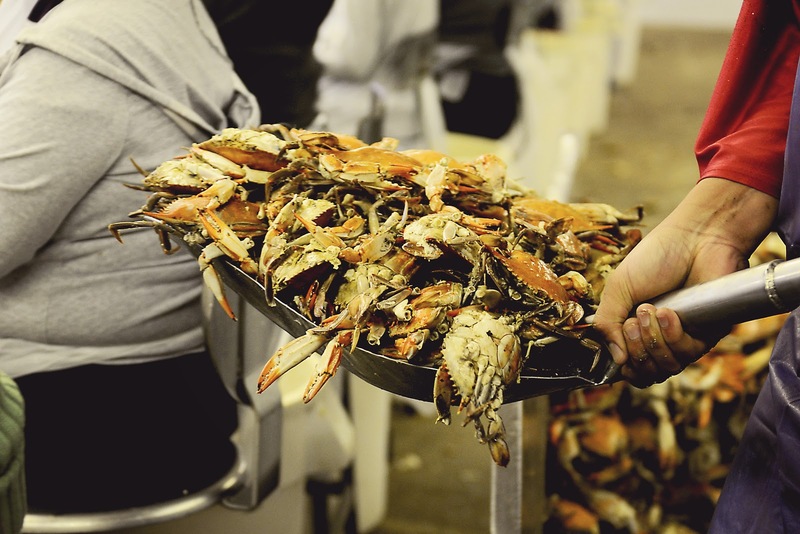 Eating crab is what Marylanders do through the summer and into the Fall months. 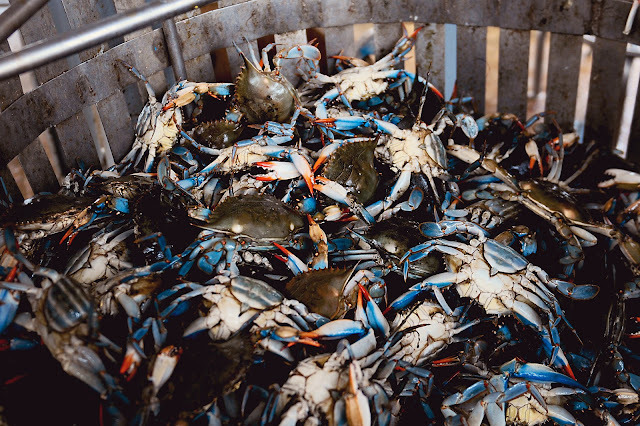 The act of picking brings family and friends together where we laugh, tell stories and eat the fresh meat that is picked from the bodies of each crab. 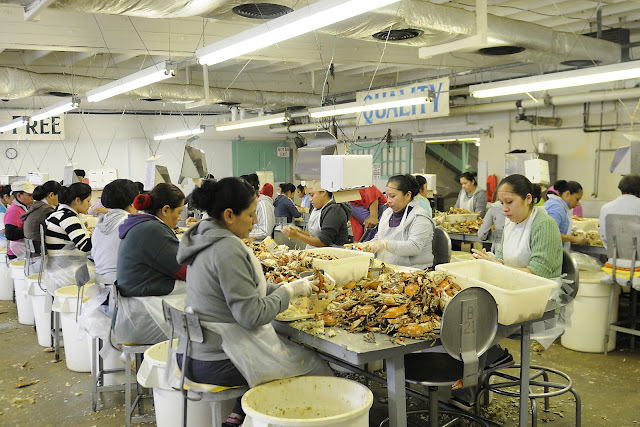 For many generations of families that have lived in Maryland, the crab industry has provided income and employment. 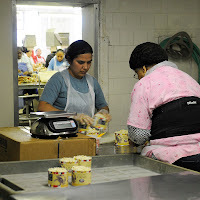 We learned of one such woman that has worked for the plant for 63 years. Her mother worked for 80+ years. I captured the hands of this woman below. The skill in which she was able to clean a crab was fascinating. We watched as she methodically did a chore that she could perform in her sleep. Over and over she turned the crab, looking for each and every pocket of meat to add to the can sitting near her. To have such loyalty and longevity says a lot about a company. It is rare and I am not sure my generation or those of my kids will be able to say the same thing. I have two recipes that are very popular on my blog that use crabmeat. Gluten Free Crab Cakes…..to make them not gluten free, simply substitute the cracker or bread for a normal version: Ritz, Club Cracker or white /wheat loaves. Maryland Blue Crab Dip…serve with baguettes, corn chips or crackers. To learn how to steam Maryland Blue Crabs visit HERE. To learn how to pick a crab go HERE. Thank you Langston for sharing the video. I was very glad that I went Marie. You should check with your local Department of Natural Resources and see if your state offers a similar program. What an absolutely amazing time, Sherron!